While most diamonds are in the colorless to light yellow range, some have a natural color that is deep, distinct, and opulent. 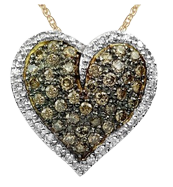 These are known as fancy-color diamonds and are often yellow (canary), blue, brown, or pink. Unlike colorless and near-colorless diamonds which are valued for their lack of color, fancies are valued for the intensity of their color. 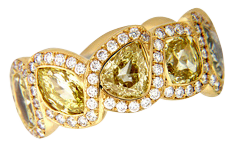 Colored diamonds are a small but increasingly popular segment of the diamond market. Throughout history colored diamonds were mainly worn by royalty, celebrities and wealthy aristocrats. Today, these rare creations of nature appeal to a much broader audience of jewelry connoisseurs. Many attribute this increase in popularity to celebrities giving colored diamond engagement rings and wearing colored diamonds at prestigious award ceremonies such as the Academy Awards and the Golden Globes. The physical conditions necessary to color a diamond naturally occur very seldom, making natural color diamonds extremely rare. For every natural color diamond, there are 10,000 colorless ones that have made the trip from the earth's depths to its surface. It is this entirely natural process of geographical formation which ensures that each natural color diamond is one of a kind. The formation of natural color diamonds is a process that requires the presence of additional trace elements and distortions to the typical diamond crystal. During the creation of a diamond, if an element interacts with its carbon atoms, the color can change. Natural radiation and pressure on a diamond's structure can also intensify its color. Rather than emphasizing the brilliance and fire coveted in near-colorless diamonds, these stones are all about the color intensity. The diamond color grading system expresses color using the attributes of hue (the characteristic color), tone (the color's relative lightness or darkness), and saturation (the strength or weakness of the color). The fancy grade describes the stone's tone and saturation with romantic names like "Fancy Light," "Fancy Intense," and "Fancy Vivid." 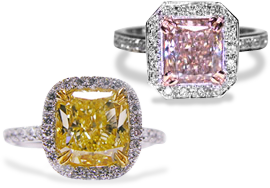 The prices per carat increase radically when you get to the rarer colors and intensities. Generally speaking the higher the color saturation the rarer the diamond and greater the price will be. Clarity is a much less important factor in determining the prices of colored diamonds. If you require more information on colored diamonds please don't hesitate to email or call us directly.